Lew Riggs played parts of ten seasons in the major leagues, debuting with the St. Louis Cardinals in 1934 at the age of 24. Riggs appeared in only two games with the Cardinals that year and on November 3 he was sold to the Cincinnati Reds for $30,000. Cincinnati was where Riggs played his best baseball; he was named to the 1936 All-Star Game as a third baseman and played in the 1940 World Series for the Reds. After being sold to Cincinnati, Riggs played in 142 games in 1935. He hit .278 with 26 doubles and 73 runs scored. Riggs hit .257 in 141 games and made the NL All-Star team in 1936. As an eighthinning pinch-hitter facing Cleveland’s Mel Harder, he was called out on strikes and finished at third base alongside shortstop Leo Durocher in the game at Braves Field. After playing two more full seasons, Riggs appeared in only 22 games in 1939 (Billy Werber was acquired in mid-March and played the bulk of the games at third base) and batted just .158. The Reds won the pennant but Riggs did not appear in any of the four games as the team was swept by the New York Yankees. He played in 41 games in 1940, hitting .292, as the Bill McKechnie-led Reds repeated as pennant winners, this time winning the World Series in seven games over the Detroit Tigers. Riggs appeared in three games — as it happened, the three the team lost. He was 0-for-3, but scored a run in Game Three after reaching base on a forceout as a pinch-hitter. On December 9, 1940, Riggs was traded to the Brooklyn Dodgers for infielder Pep Young. In his 1941 season for Brooklyn, now playing for manager Leo Durocher, Riggs hit .305 in 77 games and led the National League with 10 pinch hits in 29 at-bats. For the third year in a row he was with a pennant-winner. He appeared in three games of the 1941 World Series against the Yankees. Riggs was 2-for-8 with an RBI single in a pinch-hitting role as the Yankees won the Series in Five Games. In 1942 Riggs again played in about half of Brooklyn’s games. In his first nine pinch-hitting appearances, through May 12, he hit two home runs and two doubles, walked once, drove in seven runs, and had two gamewinning hits. One timely pinch hit broke up a no-hitter by the Cincinnati Reds’ Gene Thompson. Durocher said, “Riggs is the best pinch-hitter I have ever seen.” Riggs said, “The fans and players realize mine is a tough job and that I can’t be expected to come through too often. For that reason I can be relaxed, wait for a good pitch and cut at it real hard.”7 Riggs ended the season hitting .278 in 70 games. 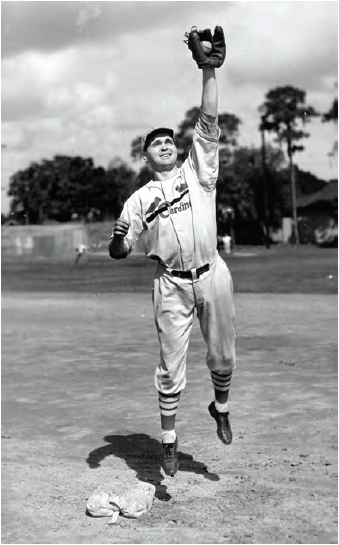 Discharged in late 1945, Riggs was nearly 36 when he reported to the Dodgers’ training site at Daytona Beach, Florida, in the spring of 1946.9After not getting the ball out of the infield while going 0-for-4 on Opening Day, he was released and spent the rest of the season with Montreal of the International League. That one game, on April 16, 1946, was his final one in the major leagues. Riggs spent the remainder of his professional baseball career (1946-1950) playing on Triple-A rosters in the Brooklyn, Cleveland, Yankees, and St. Louis Browns organizations. At Montreal Riggs hit .303 with 15 home runs and 73 RBIs. With St. Paul in 1947 he hit .315, but after that season, his batting average dropped each year, and significantly so. Riggs had a knack for being on first-place teams. In 1934 the Cardinals won the World Series while his Columbus team came in first place in the American Association for the second consecutive year, and they won the Little World Series both years. The Cincinnati Reds won the NL pennant in 1939 and the World Series in 1940, while the Brooklyn Dodgers captured the league flag in 1941. In 1946 the Montreal Royals finished the season in first place and won the Little World Series. On May 8, 1943, Riggs married Nellie Dace Hornaday. She died on November 2, 1999. They had no children. Riggs died of cancer at the age of 65 on August 12, 1975, at the Veterans Hospital in Durham, North Carolina, and was buried at the Rock Creek United Methodist Church Cemetery in Snow Camp, North Carolina. Riggs was a member of the Kiwanis Club and the Mebane Methodist Church. In 1996 he was honored by being inducted into the first Mebane Sports Hall of Fame class. This biography is included in "The 1934 St. Louis Cardinals The World Champion Gas House Gang" (SABR, 2014), edited by Charles F. Faber. 2. Email from Ron Oakley, July 31, 2013. 4. Walt Riddle, Burlington (North Carolina) Daily Times-News, April 16, 1962. 5. Chillicothe (Missouri) Tribune, September 16, 1931. 6. Burlington (North Carolina) Daily Times-News, April 16, 1962. 7. Ottawa (Ontario) Journal, May 18, 1942. 10. Burlington (North Carolina) Times-News, April 21, 2010. 12. Burlington (North Carolina) Daily Times-News, April 16, 1962.